False eyelashes can be quite intimidating. Beginners should opt for the full strip lash instead of the individual lashes as they are easier to fix. For today’s tutorial, we have used a full strip lash by UROPARIS that offers different sizes and shapes of eyelashes. It is completely safe to wear, even on a daily basis. Choose the lashes depending on the shape of your eyes. Some of the other brands you can consider are ARDELL LASHES and HUDA BEAUTY LASHES. Before going to discuss on applying false eyelashes, let’s once check the list of things required to apply False eyelashes. How To Put On False Eyelashes? 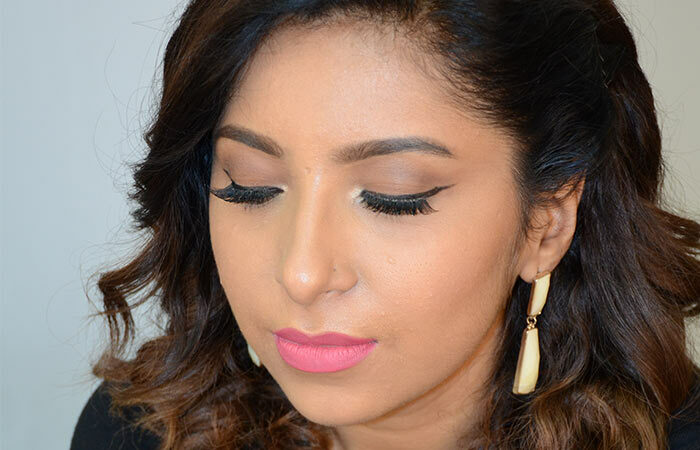 Here is a step-by-step process for applying false eyelashes. The most important step is to safely pull out the false lashes from the case. Not knowing the proper technique to pull out the lashes may spoil their shape. Place two fingers on the lashes and gently pull it out by pulling it down from the center first and then from the sides. This way you won’t have to worry about the shape getting distorted. Once you are done pulling out the lashes, twirl/curve both the ends of the lash length to form a curve, as shown in the picture. Doing this would shape the lashes to fit on the eyes perfectly. It’s always a good idea to measure and trim your lashes before putting them on. Take the lashes, and place them on your lash line and measure it. This will help you determine whether it fits the shape of your eyes or whether it is slightly longer or bigger for you. 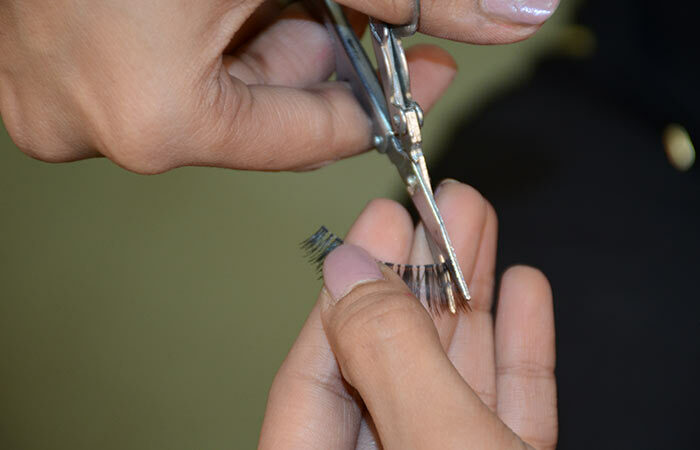 Once you know your exact measurement, take a pair of scissors and trim the lashes from the outer corner. Gently run the false eyelash outer strip rim along the glue to adhere the glue perfectly with the lashes. The glue has to get perfectly coated along the entire false eyelash strip; you can put a little excess at the beginning and end of the strip as this place needs to hold the eyelashes intact. 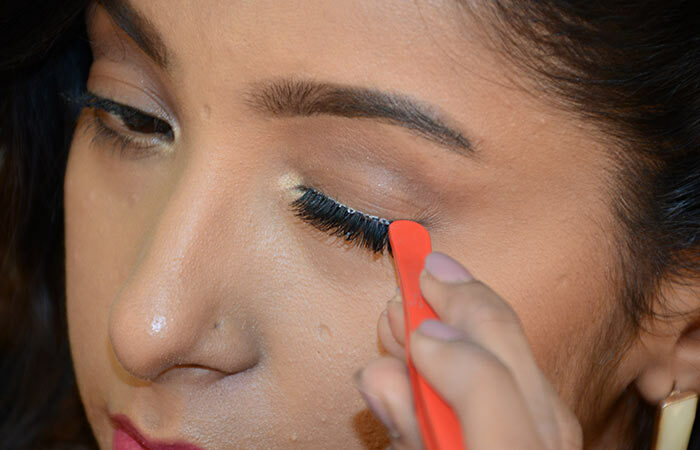 Then, hold the eyelash strip and blow gently to dry the glue a bit before applying it to your eyelids. I recommend you to hold the eyelashes at least for 20 seconds for the glue to activate. Thereafter, they will stick well to the eyelids. Now, gently place the eyelash strip on your eyelid. Position it as close to your natural eyelashes as possible. Place the false eyelash at the center of your natural eyelash first, then use a tweezer to position and fix it perfectly. It’s essential to make sure that you secure the lashes with the help of tweezers before moving on. Use the other side of the tweezers as shown in the picture and press onto the lash line. This would help to put the lash in place and ensure that it is secured. Once you are done fixing the lashes, pinch your own lashes and the false lashes together with your fingers. This is to make sure that the false lashes get merged with your own lashes. 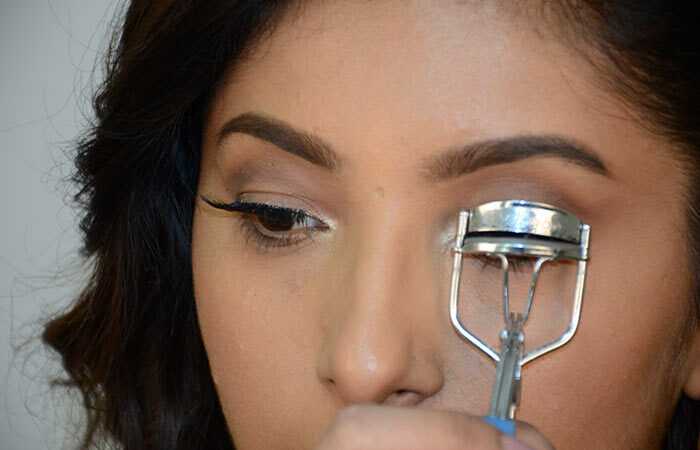 Using an eyelash curler, curl both the real and fake lashes to give them a lift. To complete the look, apply an eyeliner onto the upper lash line, where the false lashes have been applied as this would make the lashes appear more natural and cover the artificial strip line. And lastly, apply mascara for a more impactful look. Voilà! Your eyelashes now look dramatic! Cut your lashes into three halves if you are finding it difficult to put on the entire strip at once. You can use your false lashes for about 5-6 times, but ensure that you clean it thoroughly with an oil/water-based makeup remover and keep it back properly in the lash case. Avoid using too much glue – start with applying less glue, build it on if required. 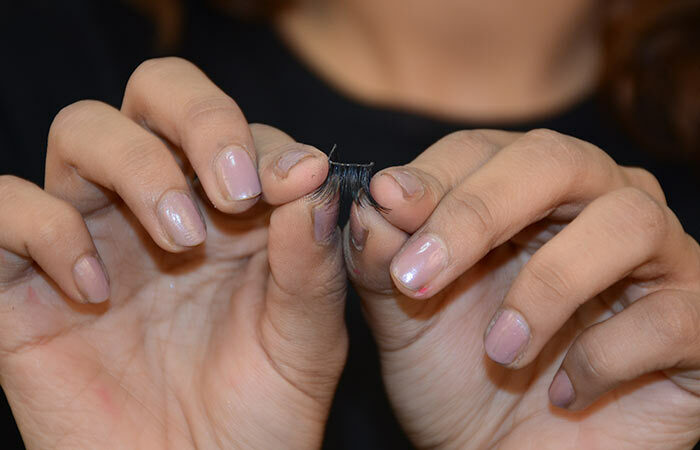 How to Remove Fake Eyelashes? Removing the fake eyelash extensions is actually quite easy. Make sure you have a steady and clean hand. Don’t rush it. Follow the steps mentioned below and keep a steady hand. Apply some baby oil on your fingertips and massage it on the eyelashes till the adhesive softens up on the extensions. Dip a cotton pad into eye makeup remover and pat it on your lashes. Now, wait for a while and gently pull on the lashes till the strip comes free. It should come off easily. See? It’s not too hard, is it? All it needs is a little bit of patience and practice and I’m sure that over time you’ll become a total pro. So, go ahead and bat those fluttery eyelashes! Try it and let us know all about it in the comments box below. How to apply false eyelashes without glue? What can i use instead of eyelash glue? You need some kind of glue to make sure that the lashes can be stuck on. However, if you prefer not to use glue, you can opt for adhesive lashes. These types of lashes already come with a sticky end so you can directly place them on top of your natural lashes. How can I tell if the glue is dry? After applying the glue, it’ll appear white. If you wait for a while, you will see it slowly becoming transparent, and it’ll feel sticky when you touch it. Once this happens, the glue is dry enough and your lashes can be applied. Can you use regular glue for fake eyelashes? It is strongly suggested that you use only the glue that comes with the fake lashes and not any regular glue. How long do fake eyelashes stay on? Will false eyelashes damage your natural eyelashes? No, they will not damage your natural lashes. Is it safe to wear false eyelashes every day? Yes, it is safe, provided that you completely remove the glue. However, it’s good to give it a break sometimes! Your natural lashes are beautiful! Can I reuse the same fake eyelashes again and again? Will false eyelashes stay on while I am in bed? Don’t do this! Always remove your makeup before going to bed. How to clean false eyelashes without makeup remover? It is strongly suggested that you use a makeup remover to clean your lashes. Do I put mascara on before putting on the fake lashes? That is up to you, but I apply my mascara before doing it. Do fake eyelashes cause styes? Yes, there are chances of it occurring. If you do not remove the glue properly, the stickysubstance can attract bacteria and cause an infection or styes. What are the side effects of donning artificial eyelashes? As mentioned before, the glue can trap particles and cause infections if it is not removed properly, so please make sure to remove the glue completely. Next articleHow To Apply Lip Liner Perfectly?